RAVENSBURG, Germany, March 21, 2019 / B3C newswire / -- Life Science Leader, a leading trade press publication has awarded Vetter, a global operating Contract Development and Manufacturing Organization (CDMO), in all six core categories of the 2019 Leadership Award. The award was granted during a ceremony in New York City on March 20. Unlike other awards, there is no application process and the winners are determined by customers ranking their experience with service providers they have actually worked with. Because results cannot be influenced in any way, the awards signify a high level of accomplishment that those companies have attained in supporting the needs of pharma and biotech customers. Vetter won the award in all core award categories – quality, expertise, reliability, capabilities, compatibility, and service. This is an affirmation of the company’s hard work in its daily efforts for customers and a motivation for continued improvement towards excellence as a solution provider. 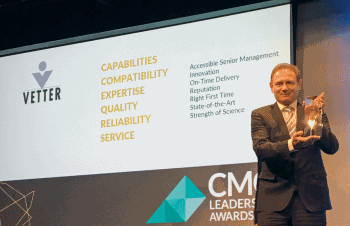 Caption: Pride and satisfaction in accepting the 2019 CMO Leadership Award.